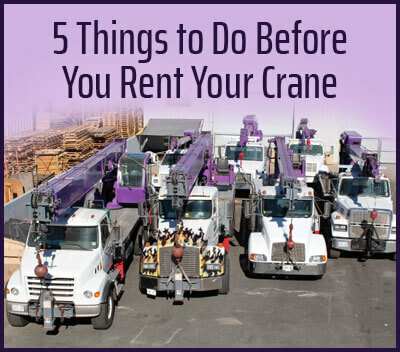 When you require crane rental and operator services in Newport Beach, call Purple Crane. We offer professional crane services at great rates, 24 hours a day. We have been performing heavy-duty and light-duty lifts since 1983, and have a highly trained crew of CCO-certified crane operators, each with 9 to 40 years of experience. 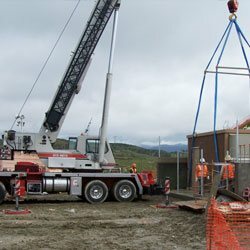 Our lift equipment includes Dynalift and Garland Light-Duty Boom Trucks; Manitowoc 22101 and Terex R35100 Hydraulic Boom Trucks; Grove 422 and Link-Belt Hydraulic Mobile Cranes; and an assortment of trucks with trailers, vans, and man baskets (capable of accommodating one or two service workers). The capacity of our lift equipment ranges from 3 tons to 75 tons, and our largest crane extends to 163 feet. These are all routinely inspected and serviced by experts to ensure that these cranes are ready to safely lift and/or move any item. Crane rental and operator services are available to our Newport Beach customers for as little as two hours or as long as two months. Every lift is completed by one of our crane experts who will select and operate the right crane for your job. Upon calling us we will ask you a series of questions in order to determine which crane will successfully complete your lift for the least amount of money. We will want to know about the terrain, the ground, the load weight, how far you want the load moved, rigging equipment needed, etc. 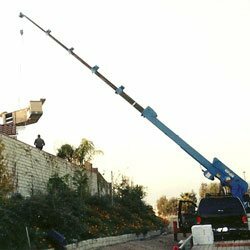 Once you provide us with a complete picture of the job, we can reliably choose the best crane to meet your needs. We will also handle any permit requests, obtain certificates of insurance, and comply with all OSHA regulations. At the appointed time, our crane driver will safely maneuver onto your Newport Beach worksite and balance the crane or boom truck at the spot that offers the greatest stability and best access to the items that need to be listed. 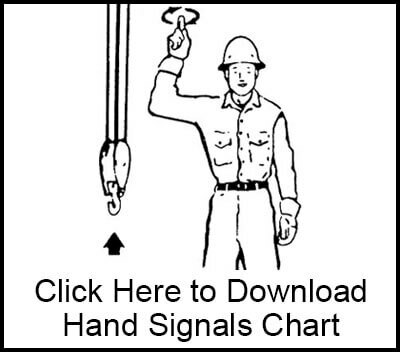 Any assembly will be completely quickly, so that your rigger can immediately get to work. With our thorough calculations and considerations at the time you book your crane rental, you won't have to worry that your crane will not be able to handle your job. Having the equipment you need at the time you need it, with as little downtime as possible, saves you and your clients time and money. As a member of SC&RA (Specialized Carriers & Rigging Association), we are always up-to-date on the crane industry's changing regulations and best practices. Call us now to learn more about our cost-efficient crane rental and operator services, available anytime of day, anywhere in Newport Beach. We are standing by to take your call. Purple Crane works with HVAC contractors in Newport Beach who need help lifting commercial or large residential air conditioning units. We can schedule a crane rental well in advance or accommodate last minute and emergency requests. Just speak with one of our crane experts about the dimensions and weight of the unit to be moved, and we will reserve the best crane to get the job done at the lowest possible price. We can move A/C units into or out of backyards and side yards. We can even place them on or lift them over rooftops. If your HVAC lift involves removing an old unit, we will haul it away to an approved recycler for free. If you are looking to remodel the outdoor space of your Newport Beach home or business, Purple Crane can help. We are available to move gazebos, spas, sheds, sculptures, hot tubs, swim spas, barbecue inlands, and more. We have helped lift, transport and place outdoor furniture, equipment, and other structures quickly and affordably for the past 30 years. Call us today for a quote. Our services are frequently required by landscapers in Newport Beach who need a crane to move trees, boulders, rocks, fountains, sculptures, or other weight dense objects. We are available day and night to answer any questions, and can obtain an insurance certificate within a day, in order to ensure that we can respond to the needs of our clients as quickly as possible. Carefully choosing the right crane for your construction project in Newport Beach--one that is not too big or too small to lift your item--is a key factor in controlling your crane-related costs. Choosing the wrong crane can cost you valuable time and money if it can't maneuver quickly, can't operate efficiently on your site, or simply can't handle your heavy lift. 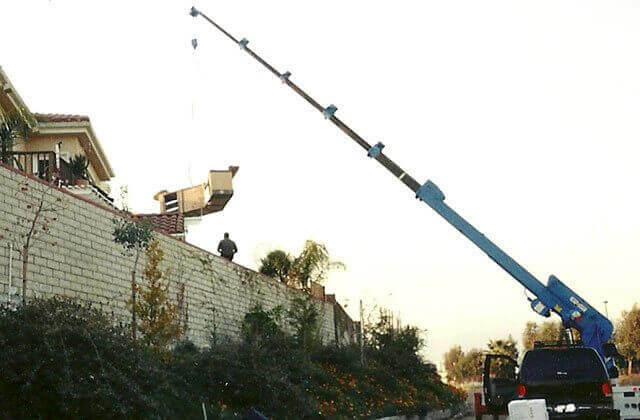 More importantly, having the wrong crane can sometimes lead to costly accidents. With every crane rental in Newport Beach, you'll get a highly experienced crane operator who will be responsible for ensuring that your items will get moved quickly, safely and cost-efficiently to their intended destination. We often move objects to another area of a jobsite, or coordinate a delivery to a scrapyard or another location in Southern California using a truck and trailer. Purple Crane has been moving heavy equipment and machinery since 1983, and can be entrusted with even the most expensive of machines. We have safely lifted and transported large appliances, printing presses, manufacturing machinery, medical equipment, generators, and more. No matter the size or shape, we can lift it. Call us today to book our high quality crane services. 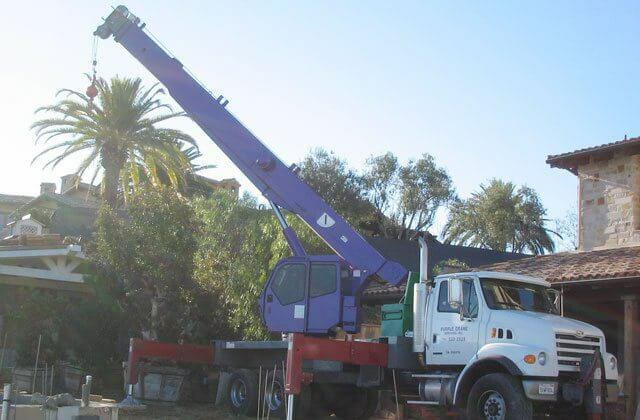 Purple Crane is the preferred choice when you need to lift shipping containers in Newport Beach. We will use heavy-duty cranes to lift one or a number of shipping containers. We can also use a truck with a flatbed to relocate one or more shipping containers to any Southern California destination. Our professionals will ask you all the right questions in order to accurately determine the best crane and/or trailer for your needs. 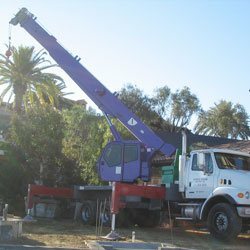 Purple Crane's range of lifting equipment is ideal to assist with the various needs of utility projects in Newport Beach. We have lifted emergency power generators, solar equipment, septic tanks, water tanks, transformers, light poles, pipes, street lights, and more. 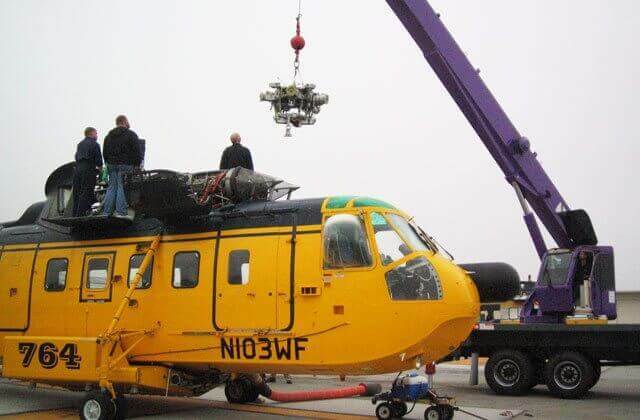 We also rent man baskets that can be attached to cranes or boom trucks. Our man baskets can hold one or two utility workers. 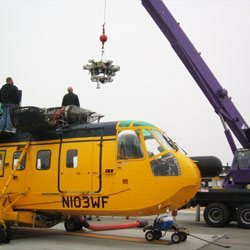 Purple Crane's crane professionals will ensure that we pick the right lifting equipment for your job in Newport Beach, the first time, every time. Call us now to speak with a live person about your crane-related needs. We'll provide an honest and accurate estimate. 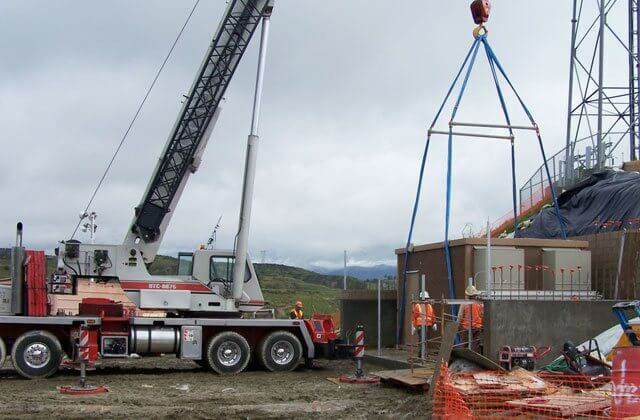 We have a large selection of cranes and a highly experienced team of crane operators that are readily available to handle lifts of up to 70 tons.